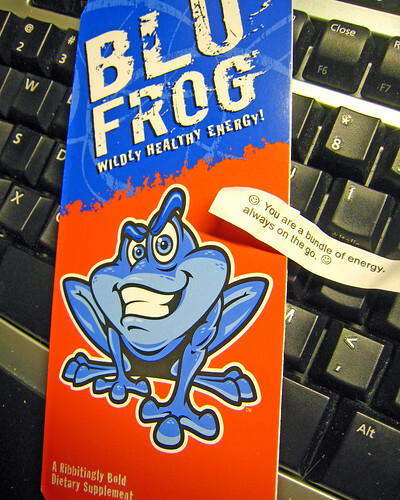 How fitting that the FortunateBluFrog Fortune Cookie post be talking about energy. So far I’ve had 4 of the cans of BluFrog from the case that I won from Martha Decker. On those day’s I am full of energy. Now, it might be from the BluFrog but it might also be that I got a good night’s rest the night before or that I worked out in the morning. I do like having BluFrog as part of my weekly routine and so far the benefits have been great. Have you Noticed I no Longer Travel? Since I switched jobs to the training and education group I have not traveled anywhere. For seven years I traveled the country and hit every state except for 5. During those times I was a bundle of energy and always on the go. I would start my week in Boston, go to Indiana, then Texas and then California and back by Friday. I was on the go, had to get everywhere as fast as possible. This meant that very often I would be faced with fast food as my meals. There are good choices at fast food places but I certainly didn’t heed them. I ate burgers and fries when given the option. Hardly ever did I order a salad as the meal and not just something else to eat. The years of poor choices, no exercise and hard travel contributed heavily to a 50 pound weight gain. During that time I was diagnosed with Type II diabetes as well. I was on the go and out of control. So I had to make a switch. On the go but in control. Now that I have slowed down a bit I can focus more on eating more healthy choices. That means taking my lunch with me to work. That way I control the portions and exactly what I take with me. Also, I have finally started exercising again. I’ve made these choices so that I will be around to chase after Eva because she is certainly a bundle of energy. So, even though I’m no longer traveling everywhere I am still on the go. This is a 3D can brochure that Jeremy Kendall of GimmeBluFrog sent for Blogs, Brews and Belly Laughs to go with the case of BluFrog that Jeremy is sending to me to give out at the event. Smart move making the choice for your health and especially for Eva and Allison.